Stylish and striking, the Linear Brushed Steel Bar Stool Cream is the ideal addition to any room where you want to make a statement. Upon the cream faux leather seat, stitching is used to construct comfort-enhancing, padded segments that simultaneously create a distinct visual feature. 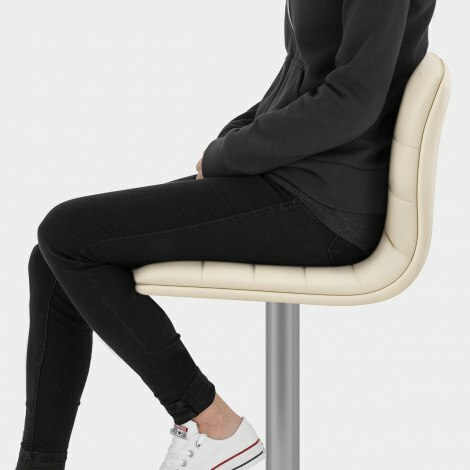 A high backrest as well as a distinctive footrest enables superb support whilst seated. Hand finished brushed steel gives the stools metalwork a smart aesthetic quality whilst the convenient gas lift mechanism ensures variable height as well as 360-degree rotation. Incorporating a protective ring under the base to look after your floors, the Linear Brushed Steel will immediately enhance the look of your bar area. "Great product looks fantastic. Lovely colour"
Delighted with the prompt delivery of our new stools. Ordered late Sunday evening and they arrived to Ireland on Wednesday afternoon, the week before Christmas. 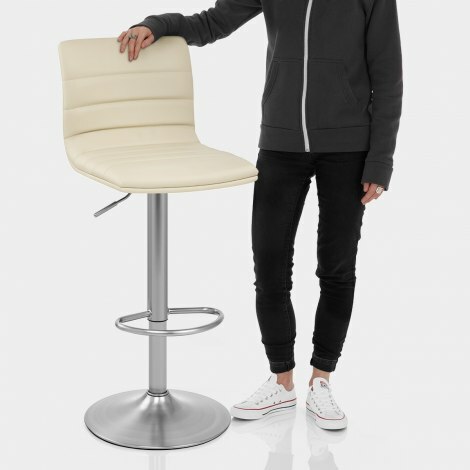 Stools were very easy to assemble and are very comfortable to sit on. The brushed steel finish is stylish and they are a very attractive addition to our new kitchen. We are very happy with our recent purchase of 4 of the Linear Brushed Bar Stools. They were delivered quickly and look great in the kitchen. They are nice and light to move around but also very sturdy to sit and swivel on. Would recommend Atlantic to friends and family. Great service. The product was exactly as described and arrived within 24 hours of ordering. Purchase 4 of these chairs for our new extension - and have had so many comments on how lovely they are. Prompt delivery, very simple to assemble, quality product. Really impressed by these - will purchase again when we do another conversion! !